You are here: Home / Photography / Reliving My Sister’s Wedding. In Pictures. Reliving My Sister’s Wedding. In Pictures. A few months ago, I put together a hard-bound book of my 365 project photographs and had it printed by Shutterfly. After my sister’s wedding, there were HUNDREDS of amazing photographs I needed to have printed, that I needed to have forever. 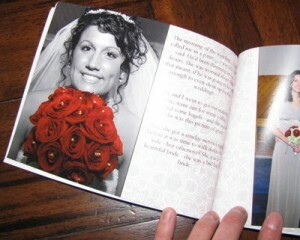 Shutterfly gave me the opportunity to put together a soft-cover 5″ x 7″ book of photos. I’m not a scrapbooker – I have a horrible time figuring out the “best” way to layout a group of photos. For some pictures I knew I’d want space to write a long caption – on others, I wanted the photo to speak for itself. Shutterfly’s storyboard functionality made it pretty easy for me. Using the storyboard, you simply determine what pictures you want on each page. Shutterfly then picks a layout that is best based on the orientation and size of the images. If you don’t like what’s chosen? No biggie – you can manually change the layout just by clicking a button. Easy peasy, right? It’s been fun to have a small portable book that fits into my bag, though. This is the perfect size “brag book” and isn’t cumbersome at all. My mom loved my book so much, she bought one of her own. Much larger though, as she wanted to use WAY more photos than I did (she opted for the bigger sized book, with a hard cover). It’s important to note, as a friend of the photographer – that I was given the rights to reproduce these images by my BFF, the photographer – and that to use copyrighted pictures without authorization for such purposes is no good – please get permission from the photog first! So cool! Wish I could see it too. Robin is an awesome photographer – have browsed lots of the wedding pix. Wowzer is she talented. I just ordered my first Shutterfly album today! Have been working on two of them for a while now, but had to quick finish up to take advantage of their Halloween discount right now. I am SO excited to get them! !